There's no question that being closeted is emotionally and psychologically taxing. Now, newly-published research demonstrates that gay, lesbian and bi people who are out have lower stress hormone levels and fewer symptoms of anxiety and depression than those who hide their identities. The findings suggest that while coming out of the closet can be incredibly stressful, the long-term health benefits of disclosure are worth it. Especially if you are a man. In a study led by Sonia Lupien, director of Canada's Centre for Studies on Human Stress, researchers asked 87 volunteers (46 lesbians, gays and bisexuals, 41 heterosexuals) to answer questionnaires designed to gauge symptoms of depression, anxiety and burnout. Test subjects also had their blood, urine and saliva sampled multiple times over the course of 48 hours. Samples were scanned for the stress hormone cortisol and more than twenty other biomarkers of health and wellness, like cholesterol, insulin and adrenaline. Openly lesbian, gay and bisexual test subjects were found to have fewer symptoms of depression, and lower morning cortisol levels than their closeted counterparts. Lesbian and bisexual women also had more pronounced symptoms of depression and anxiety than straight women. 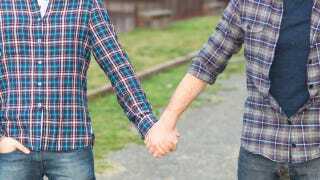 What came as a surprise, however, was the observation that gay and bisexual men had fewer depressive symptoms and lower cortisol levels than heterosexual men. Why might gay men be less stressed and depressed than straight ones? The researchers aren't sure — but they have some ideas. A re-evaluation of specific biomarkers revealed that the gay and bisexual men who participated in the study had significantly lower levels of triglycerides and body mass indices than the heterosexual ones; "a behavioral explanation consistent with the literature," writes first author Robert-Paul Juster in the latest issue of Psychosomatic Medicine, "may be that gay/bisexual men are more likely... to focus on thinness and muscularity by means of diet and exercise." Given that two thirds of gay and bi participants had completely disclosed their sexual orientation, we ascertained whether these surprising reversals were caused, in part, by coping processes inherently related to disclosing one's sexual orientation to family and friends. Our within-group analyses suggest that full disclosure, at least among our Montréal-based sample, is a form of coping strategy that fosters mental health and physiological integrity. Emphasis added, because it draws attention to one of the most significant shortcomings of this investigation (one the researchers acknowledge): that the study's gay, lesbian and bisexual participants (all of them from Montréal) likely benefit from Canada's progressive social policies in tangible, even quantifiable ways. It stands to reason, for example, that had this study been conducted in Tehran (an exceedingly unlikely hypothetical — Iranian police routinely extract confessions of homosexuality through torture, and gays and lesbians can be punished with a death sentence), the results probably would have looked very different. Societal intolerance during the disclosure process impairs one's self-acceptance that generates increased distress and contributes to mental and physical health problems. Internationally, societies must endeavour to facilitate this self-acceptance by promoting tolerance, progressing policy, and dispelling stigma for all minorities.